Thought it would be a good time to start up the thread for the upcoming official F1 game from Codemasters. For those that don't know last week Codemasters held a closed beta test that 8 people were invited to. 5 F1 Youtubers & 3 forum members. Now this is pretty exciting because after a couple of, let's face it, poor games it seems Codemasters are finally going in a direction more in line with what people are asking for from the game & seem to be more interested than ever in community feedback and improving the game. - Career mode (where you play as yourself) is back. - Safety car is back. - Career mode is apparently the most immersive it has been with lots of new features & content. - The game is now more difficult, moving slightly more towards a sim style gameplay than it has been. The Youtubers have mentioned throttle & braking being more difficult, the car not being as glued to the track, wet weather being much more difficult to handle. I'm looking forward to this one. It sounds like the content has improved a lot, now let's just hope that it doesn't have all of the glitches that F1 2015 had. The only F1 game I played more am than a few hours on was F1-2011. Never really interested me to play it, and I found that it took to long to get up to speed with the game and not crash every now and then. Immersion would be a big pull factor for me, I find it very important in career mode. It sounds good from what you've said - yet to look up anything about it really. Might give it a proper go this year, especially with Assetto Corsa having another delay on the PS4. I've never found an F1 game on any console or PC that has come close to being as fun to drive as other driving games. Here's hoping this is the one. Small disclaimer here because going back far too long, Microprose Grand Prix 2 was stunning in it's day. A real ground breaker of a game. Are you talking about the F1 manager game? If so i still play that! They need to make a new F1 manager game, or have it integrated into a career mode, kinda like how in Fifa you can play as a player, then become a team manager after you retire. Sorry to derail this thread, but this needs to happen. EDIT: Thinking out loud here, i wonder if that is one of the features they can't talk about? I still hold out hope that they'll introduce GP2 - and eventually GP3 - into the career mode. I would absolutely love a career mode that allows you to start with a GP3 backmarker, your performances with them opening up options further up the GP3 grid, or the GP2 grid, or even a direct route to F1 if your performances are that good. Or allows you to attract sponsors in order to fund a GP2 seat, or establish links with F1 teams to have them back your junior career and prepare you for F1 that way. I would buy that on day one no matter. This is something that they have hinted at, one of their designers posted on Twitter that it's one of things he would most like to see in the game, but that it wasn't in this one. The issue I think comes mainly from the licensing requirements. No, the driving game. It was amazing and being set in 1994 it included Jerez which I always loved driving. I believe that was also Microprose's last foray into it as well, i dunno why but i always like GPM2 the best. I find myself returning to F1 2015 now to race the track of the upcoming GP. The first noises from the testers of the game in development do lift my expectations. I don't think Codemasters have announced a release date yet? F1 2016 was officially announced for a summer release. Here's an article on it from this morning. It was apparently put on Amazon for pre-order with a release date of 16th August. I say apparently because I saw a screenshot and it has now been taken down, can't verify whether the screenshot is real or not. So some interesting stuff then. 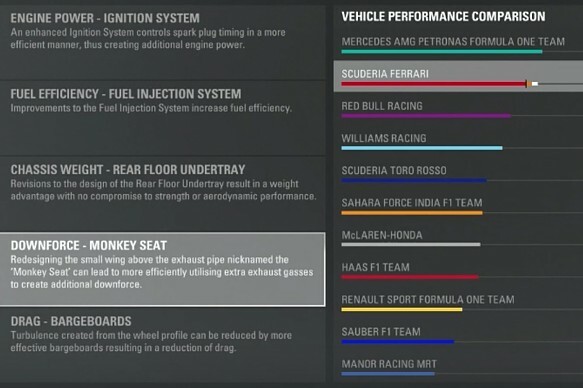 In career mode car performance of all teams will randomly change with upgrades throughout the season, you also earn R&D XP to help your team get working upgrades. Sounds pretty damn cool tbh! Also random little bit I found cool is there are now pit-boards that show actual real time info held out by your team, that's an awesome little bit of detail. What an absolute beast of a game. Played it up until I moved house which was around 3 years ago - although I'm still nosing around for a cheap PC to run it on again in the future. What I loved about it was its simplicity; no career mode as such, just choose your driver (or put your own name in) and do a season. Then the following season just put your name in a different team if you fancied it. No team targets, no gimmicks, just practice, qualify, and race. I used to mod it to such an extent I would patch a GP2 field and circuits into it, play a season or two and then patch in the current season's F1 field and circuits and continue my career from there, and then add each season accordingly. It felt so real! I've recently been playing MotoGP'15 on the PS3 and, minor glitches aside, the career mode is brilliant. Work your way up from Moto3 up to the premier class and then try to bag yourself a top ride there. It's really good. Also SBK Generations is a brilliant game. It includes 3 or 4 seasons' worth of bikes and tracks, all in different classes. If CM did this with their F1 games I'd be first in line. Also, now they've done F1 games since 2009, why don't they add the option of starting your career in 2009 and then work your way through the seasons? I know EA Sports did this some years back on the PS1/PS2 so it's definitely possible. Only some minor calendar changes and car/driver line ups would need tweaking, which I don't envisage as a massive hurdle. Doing a career stuck in the same season again and again just doesn't do it for me. I bought 2011, 12, and 13. To me it's absolutely ridiculous to buy a game in September when the season is almost over. I don't want to buy a game with Massa on Williams when it's been announced he won't be there next year. The game should be out in March. I just don't get why they do this. Well they need to wait until the season begins so that they can accurately portray the sport e.g. - Relative performance of cars - this could probably be sorted out fairly quickly though. - Rules - I follow one of the designers on Twitter who was in charge of the qualifying in game and the drama with all the changes this year meant he couldn't commit to a qualifying format in game until it was decided in real life. - Overall performance of cars - just think, until a few races into next year we will have no idea how 2017 F1 cars will perform (how much downforce/top speed they will have and we won't know what lap times they are capable of) and neither will the game designers. On top of that I don't think they are big enough to turn around a game that quickly. They realeased F1 2015 earlier last year in July but it was riddled with bugs. They have since said it was an over ambitious target for them last year and so we will be getting this one a bit later (mid August I imagine). Still I'd rather have a working game then, than a half built one now. I'm not surprised that the game is out in August, they had big plans for 2015 to update constantly from the early release and they couldn't keep it going. That said, 2016 seems a big leap forward. 2015 had the best gameplay so far so as long as they have that as a starting point I've got high hopes for this. I was invited to the beta test too, unfortunately the nature of that agreement was that we can't talk about our experiences in any way or form, which is a shame but probably understandable given that it was essentially just F1 2015 content with the F1 2016 handling model, and the beta was aimed at feedback/bugs relating to the handling. The last version of the game I bought was F1 2012 but I might pick this latest one up. A short trailer was released today. - 22 person multiplayer (up from previous maximum of 16) for online races. This game looks great, can't wait to play it next month! Finally, CM looks to be getting it. After 7 attempts. I'm still sceptical as to whether they have got the game just right though. The R&D stuff is just pants and I still don't get why we have to play the same season over and over again in career mode. I like the idea of the R&D. I like that the other teams can also develop now, not just the one you are driving for like in the past (2012?). I'll reserve judgement on how well it works until I play through it. I'd like to see a random mix up every 3 seasons or so though and I agree it should properly roll forward in game and come up as 2017 etc. rather than just "season 3". What platform are people planning on getting it on? My PC is decent, however i don't have a wheel so i was thinking PS4 just to utilize it a bit more ( I rarely use it and only have 2 games for it! ). Either way i'd be using a controller, the other plus on the PS4 is that it'd be on a better screen. They've also announced an online mutliplayer championship. I'm sure they had this in previous versions but now it's allowing 22 drivers to take part. I've never bought an F1 game, but I purchased the PS4 version last night after reading several solid reviews. I'm excited to get into it, and while I'm not a big fan of online, I may have to get into some of those 22-player online races once I get fairly decent. Guys I think Codies have finally cracked it.. Feels and looks like the best F1 game yet and I've barely scratched the surface! - Proper Career mode. You choose your team and they give you a timeframe to win the championship. Brilliant. - Development - you choose the areas you want the car to be developed in, using points earned in..
- ..Practice - Practice has really been given worth now! You do development exercises for the team - outright pace, learning the track (which is almost like an apex hitting mini-game) and tyre saving. You get all 3 practices to try and complete these tests, as well as further tests to earn extra points. It works really well and forces you to learn the track. - Sound/Graphics - The cars and tracks look stunning with a lot of colour depth. The V6's sound throaty and off throttle the Honda sounds dirty! Couldn't say how the rest sound but I'm enjoying the sound design. (It's obviously not a V8/V10 but this isn't the place for that). Overall, it looks and sounds good. - Lessons - In 2013/14 there were videos narrated by Ant Davidson for each track for the best lines and gears to take each track in. I might be wrong but it looks like these still haven't returned. Or at least I haven't seen them.. will delete this if I do find them.. It's little things like this which make this overall package so much better than 2015. I can easily recommend getting this, though I will warn that it is HARD. Currently I'm playing career on 3rd from top difficulty with Mclaren and it's kicking my pickle - which is great. I shouldn't be able to stick a Mclaren on the front row and it's (painfully) reminding me of that. Will update this review as I go through but it's a solid 9/10 for me. Can easily recommend this. Can't wait to get further into the races and progress. I've resisted picking it up yet simply because of Codemasters' history with terrible day-one bugs (also because I'm still hooked on No Man's Sky). But there seems to be a lot of positivity that they've delivered their best F1 game to date. My best mate got it and has been raving about the controls, saying it works really well with a pad. So I'm hopeful the experience will be even better with a wheel. Love that they've given value to practice sessions (although I would argue they had value in previous versions anyway, at least for me) and reintroduced the career mode. Particularly with the potential for different teams to end up at the front. Still wish they'd introduce GP2 (and ideally GP3) so you can start your career in the feeder series. I'd love to have the starting place in F1 influenced by how you do in GP3 and GP2. For instance, if you win the GP3 title then you get opportunities to move to a top GP2 team, links to F1 teams as a reserve driver (getting to drive in FP1 and improving your reputation by succeeding with the mini tasks they have) or even potentially landing an F1 seat directly. And if you move up to GP2, your F1 opportunities expand. Maybe introduce driver sponsorship which would be based on success in the feeder series, or even how you deal with the press/fans (i.e. making yourself more marketable) and allowing you to perhaps buy a seat in F1 rather than waiting for feeder series success. Would be cool if drivers moved around/retired as well, especially if there was a proper contract system in place, drivers signed for x years and then speculation that they might be replaced, that they might move onto another team, etc. If you had GP2/GP3 and drivers being associated with teams before reaching F1 then you could have young drivers coming into F1, and after three or four seasons the feeder series would start having randomly generated drivers to keep that system going. I've seen in the past that this apparently isn't allowed due to the licensing agreement but I'll continue to hold out hope that they can find a way around that in the future. I fully agree with this, especially the drivers moving teams. I've never liked being the only driver that moves around, not only that but cars should differ in performance from year to year, Who's to say that next year Mercedes ends up bottom and HAAS wins the championship? I know it's unlikely but even little ebbs and flows in performance differential would be great. This year they have incorporated performance shifts, so there is a full blown development race and you affect how much your team improves by how well you perform in practice tests. Driver changes would be brilliant but I can understand the headache that would cause with teams/sponsors presumably not being happy with it. I think they would need to incorporate GP2/3 first though so that some drivers could retire and a younger driver could move up into F1, rather than it just being a seat swap between the drivers currently on the grid and e.g. Massa driving well into his 40's. Haha yeah just read a few reviews! Very exciting! I'm definitely going to pick this up! I wonder if the AI teams will continue to move evenly or not ( for example until your team catches up Mercedes will be the team to beat and 2nd thereafter ) or if they will move at different rates because i haven't found any info how this works on the AI side of things, just how you can affect your own teams performance. EDIT: Just read your articles, seems that the AI will move differently, thats pretty darn cool! I agree, although it shouldn't be hard to create a system smart enough to stop that happening. Just assign every driver a contract duration and an age. At the end of each contract the system would take in a couple of factors (performance relative to expectations, performance relative to teammate, age, other available drivers) and make a decision on that driver's future. As they get older the likelihood of retirement increases, but isn't guaranteed, especially if they are driving well. They could even introduce some sort of reputation system that assigns each driver a percentage that fluctuates according to how they're driving relative to expectations and their teammates. Drivers with higher values are more likely to be linked to bigger teams. Drivers doing badly are more likely to be dropped (or retire if they're older). Something like that would be great as it would allow the game to create news stories relating to the driver market. As jasonthebadger mentioned, being the only driver to ever change team is a problem as it damages the realism of the career mode. Exactly! Grand Prix Manager was allowed to do this ( have drivers move teams ), I realise that the rules were different back then and sponsors wern't as pushy but most players wouldn't play more than a season or two before moving on to another game, so why can't they have driver movements, it would make the game a whole lot more interesting! Even if they kept the same drivers and they just shuffled teams as to not offend any drivers that could be on the way out. You can move athletes around in every other sport game, it's silly that you can't do it in F1. I was going to make exactly that point. Two of the most successful sports series of all time - FIFA and Football Manager - both have career modes where players move around as they would in real life. Obviously there is a certain element of apples and oranges here but the fact that F1 drivers are so rigidly fixed within the career mode of F1 games is a shame. It also strikes me as another example of a) F1 being behind the times and b) F1 being far too focused on pleasing the sponsors. I have also picked up 2016 and i must say its alot of fun. I started a season with mclaren as well. Playing on expert at the moment and its tough, really gotta get every once out of the car and fight for position. Been finishing in the points but not at easy task by any means. To change difficulty mid season after u select continue career and it starts loading to the track go into settings on the screen and u can make changes mid season. Itll help you develope the car faster by getting max points on the r&d.